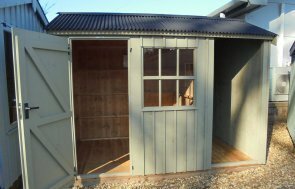 This 1.8 x 2.4m National Trust Felbrigg Garden Shed has been installed to be used as a potting shed. Like all of our bespoke Garden Buildings, it was delivered and installed for free as part of our dedicated service carried out by our experienced team of fitters. We source our timber from a partner mill in North Sweden, ensuring we're using the highest quality material for your garden building. As with all our National Trust Sheds, this shed is traditional in style. This can be seen in its black corrugated roof material and cast iron furniture, vertical sawn boards and Georgian style windows. It has been painted in Terrace Green paint from the National Trust Colour Range. This particular range is available in 3 to 4 sizes per design. 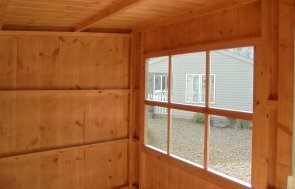 If you're looking for a Garden Shed in a greater range of sizes, we recommend you look at our Superior Sheds. We have a wide variety of luxury garden buildings, and we invite all prospective buyers to visit one of our seven UK National Show Centres. If you have any questions, there are several ways to get in touch. You can Request a Callback, Contact Us or call us on 01760 444 229.